The Debug page includes quick access to log messages through an in-page logs panel, allowing you to see log messages next to your source code. Note: The logs panel is currently only available for Google App Engine apps. Click the Logs button below the file contents to expand the panel. You can search through all of the available logs with simple text search. 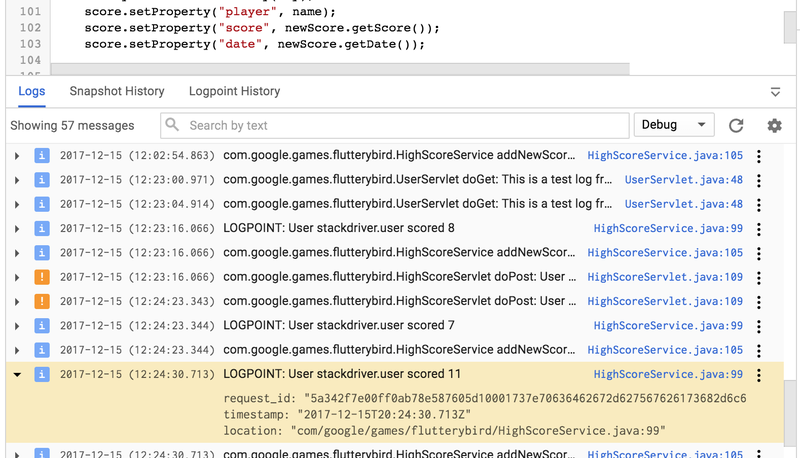 Logs are filtered as you type, so you can quickly determine if any logs match your query. Text is treated as an exact string. To make an AND search for multiple terms, press Enter between each string. Filter by request returns all log entries generated by the same request. Filter by file returns all log entries belonging to the same file, regardless of request or line number. Show in context highlights the selected log entry and returns to unfiltered view, allowing you to see the entry in context with preceding and following requests. Note that Show in context is only available once the results are filtered in some way. Show in logs viewer opens the log entry in the GCP Console Logs page and shows detailed information about the request that spawned the log entry. 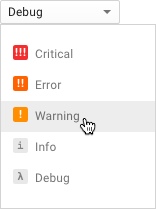 The drop-down menu above the log entries allows you to filter by log level, from Debug to Critical. Each level also includes entries from the levels above it.